What better way to cheer up a cold grey day than a slice of Dorset apple cake with, if you like, a dollop of thick cream or custard? Most apple growing counties make some kind of apple cake but the one from Dorset has become the most well-known. It’s a regular in local bakeries and cafés and won a competition to be named the county’s ‘National Dish’ in 2006, held as part of Dorset Food Week that year. To use up some leftover cooking apples I decided to bake a Dorset apple cake. What better cookery book to turn to than The Piddle Valley Cookbook, full of “the favourite recipes of the people of the Piddle Valley”? 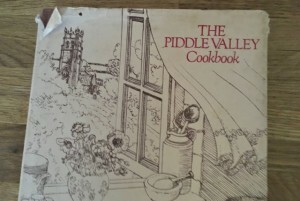 My mum bought it years ago when we lived in Dorset near the valley. That’s her notes in the margin. It’s now a bit dog-eared and you can find it, back in Dorset, in our West Bay cottage. 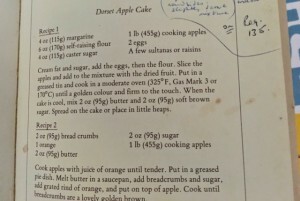 It has two recipes for Dorset apple cake. The first one looks a little plain. It uses margarine rather than butter which I expect is a sign of its time as the book was published back in 1978. 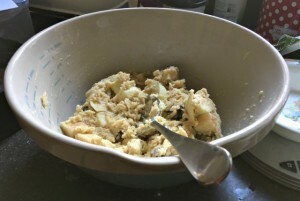 The second recipe isn’t a traditional cake mix at all with no sponge but a bread-crumb, orange, butter and sugar crumble on top of stewed apples. Interesting, but not what I was envisioning for my Dorset apple cake. I turned my attention to the internet to find a recipe. Oh my, there are so many different variations. Cinnamon, sultanas or lemon? Wholemeal, plain or self-raising? Mary Berry, Waitrose or BBC Good Food? A couple of years ago the Guardian newspaper carried an article on “How to cook the perfect Dorset apple cake”. 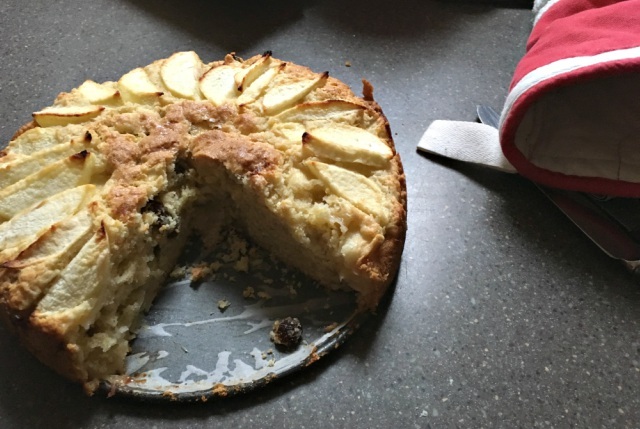 The writer used a variety of recipes and experimentation to come up with her own ‘perfect’ apple cake recipe. But does this make it authentic? The writer in this article liked best the cake made by Bridport’s Leakers Bakery. He even interviewed the baker but sadly she wasn’t giving away her recipe “handed down and tweaked” since 1914. The photo here is taken from the article and is a slice of the praised Leakers Bakery cake. The recipe from the Dorset Foodie Family blog looks a good one. 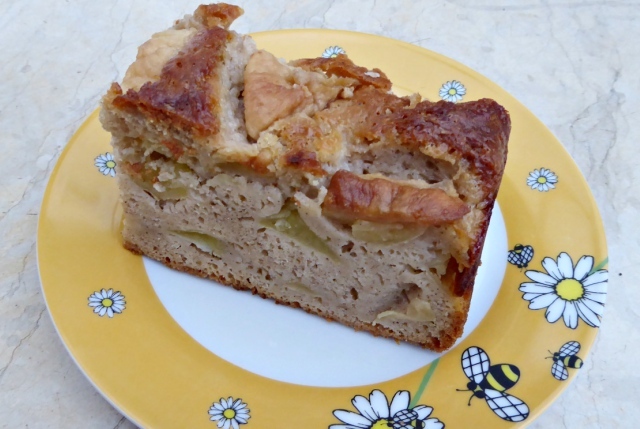 The post has a reader’s gallery of Dorset apple cake photos too. I ended up plumping for this recipe, “Greg’s Dorset apple cake“. It’s the one which won the 2006 competition and includes sultanas and lemon but no spices. Here’s a photo, work in progress. Yum. That’s it in the top image. We’d already had a few warm slices before I thought of taking a photo which, to be frank, wouldn’t win any food blogger prizes. Why didn’t I move the oven glove and put it on a nice plate? Anyway, very nice and lemony, and not a bit like the one I had just before Christmas in the Watch House Café on the beach in West Bay. So it seems there is no definitive recipe. 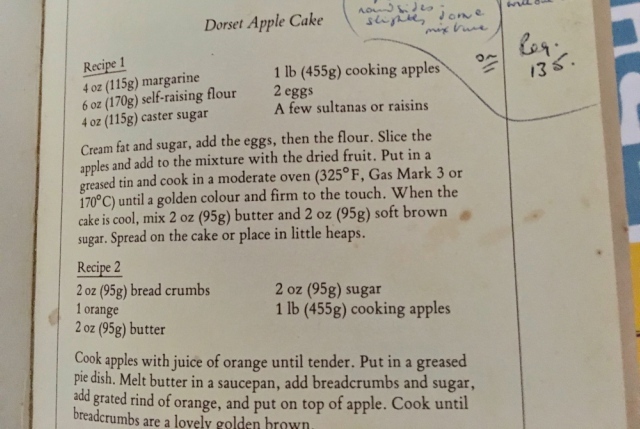 As long as the ingredients include apples with brown sugar sprinkled on top, then yup, you can call it Dorset apple cake. Do you have a favourite apple cake recipe? If so please share it here by leaving a reply. As for me, that’s enough typing, I’m heading off to the kitchen while there’s still a small slice left. Best eaten fresh – what a drag. If you’ve read this and now fancy a holiday where you can eat Dorset apple cake in lots of the local cafés and tea rooms (and who wouldn’t) we’d love to welcome you to West Bay Cottage! Please take a look inside the cottage or head to our Enquire and Book page for availability, the rates and how to book.